Kotaku Shop Contest: Lighten Up, Dark Souls: Winners! Last week I asked our Photoshop-savvy readers to bring a little bright and fluffy to the dreary world of Dark Souls. This is the prettiest ‘Shop Contest winners post ever. You folks have got a lot of brightness in your hearts, as I expected. There were so many spectacular entries for last week’s contest that this post will probably finish loading sometime in May. 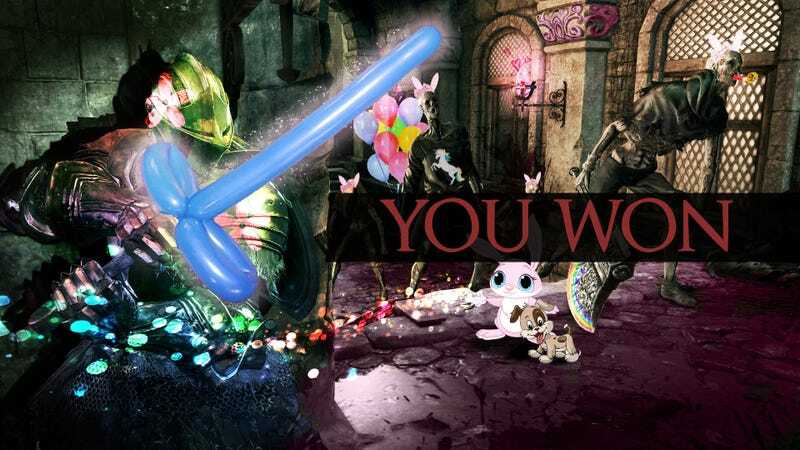 My personal favorite entry this week comes from contest newcomer jkash23686, whose combination of balloon swords, bunny ears and rainbow-edge battle axes set the tone for the contest perfectly. In judging this week’s winners I stuck strictly to the “Lighten Up” theme. If your entry made the game scarier, it was not considered. For example, Miligan’s entry is freaking terrifying. But, since it does not make the game any less dark and terrifying, it will not be featured in this post. Except for up here at the top, apart from all of the other entries that did make it. Take that, Miligan. Speaking of which, there are a lot of those. Like, tons. This week I’m just going to drop names under the images, as I don’t have that many clever comments in me and there’s a clever comment contest at the local bar tonight. If you didn’t make it into the winners circle this week, don’t take it personally. I ran out of time and room. Seriously, so many good entries. I hope they’re as good for the next contest, which might happen later today!